This 3-in-1 travel adapter offers a portable solution for connecting your USB-C computer to a VGA, DVI, or HDMI display. The travel adapter is compatible with your DP alt mode computer. DP alt mode means your computer can pass a DisplayPort video signal through the USB-C port. This travel adapter comes with a built-in black USB-C cable and works well with your Dell XPS, MacBook and any device that supports USB-C DP alt mode. Instead of carrying three separate video adapters in your laptop bag, this 3-in-1 adapter gives you all the video outputs you’ll need. 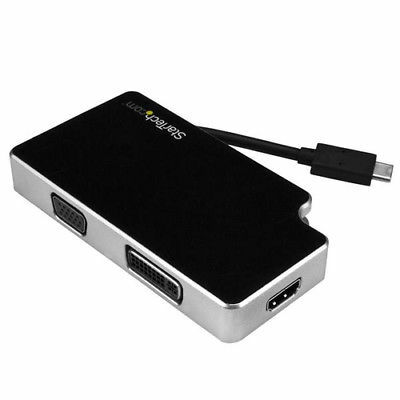 With VGA, DVI and HDMI outputs, this adapter lets you connect from your laptop’s USB Type-C port to almost any boardroom or classroom display, without the inconvenience of carrying a separate adapter for each display type. With support for multiple video outputs and a small-footprint design, this adapter is the ideal plug-and-play solution for travel or BYOD (Bring Your Own Device) applications around the office. The adapter features a built-in cable fastener. Simply tuck the cable into place along the side of the adapter for quick and secure storage while you’re traveling to ensure the adapter is neatly stored in your travel bag. The HDMI output on this travel adapter supports Ultra HD 4K resolutions, providing four times the picture quality of high-definition 1080p. The HDMI output is also backward compatible with lower resolutions, such as 1080p and 720p, so the adapter is also perfect for your legacy video equipment. The VGA and DVI outputs also support high-definition maximum resolutions of up to 1920 x 1200, so you can still enjoy excellent video quality. The travel adapter is compatible with USB Type-C Intel Thunderbolt 3 devices that are capable of outputting a DisplayPort signal. The CDPVGDVHDB is backed by a StarTech.com 2-year warranty and free lifetime technical support. macOS 10.12.6 or later is required for your MacBook to support this product.